BEIJING — China reported steady economic growth in the first half (H1) of 2016, and a closer look at the performance of different provinces really shines a light on the world’s second largest economy. Some 26 provinces, regions and municipalities have released their H1 GDP data, with the western regions of Chongqing, Tibet and Guizhou all reporting growth rates above 10 percent. Moreover, 21 of the provinces, regions and municipalities saw GDP growth exceeding the country’s 6.7 percent for the same period. Emerging industries become increasingly important to local economies as economic restructuring enhances growth quality. Chongqing Municipality, which has reported eye-catching growth speed for the past ten quarters, shared the fastest growth of 10.6 percent with Tibet in H1. The added value of the city’s ten strategic emerging sectors like new materials, robotics and electronics, grew 24.8 percent in the first half, or 14.6 percentage points higher than the city’s industrial growth rate. Still, they have robust growth prospects. “Although the added value of emerging industries accounts for only 15 percent of the whole industrial added value, their contribution to industrial growth was 28.3 percent,” said Zhang Fumin, deputy head of Chongqing Municipal Bureau of Statistics. The heavily polluted province of Hebei in the north, also made progress in structural reform and posted 6.6 percent growth for the period. Raw coal output fell by 8.8 percent and the production of glass also dropped by 4.5 percent in the first half, according to Hebei Provincial Bureau of Statistics. 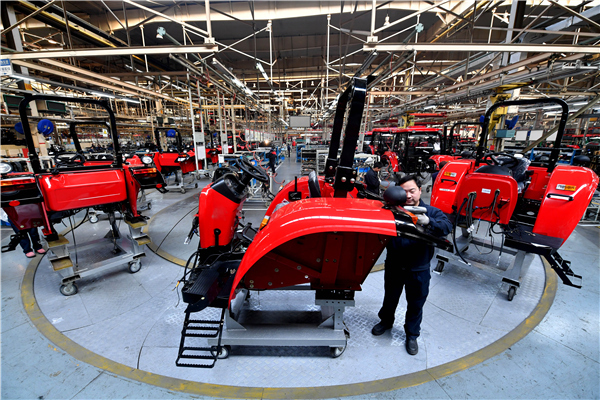 The proportion of the equipment manufacturing sector’s added value in Hebei’s industrial added value surpassed that of the iron and steel industries for the first time in H1, reaching 25.3 percent, according to an official with the bureau. Hebei aims to further cut its excessive iron and steel capacity by 17 million tonnes and 14 million tonnes respectively this year. Business startups are booming nationwide, thanks to the “Internet Plus” program, various innovation strategies and administration streamlining. In the eastern province of Zhejiang, the tertiary sector, led by information-based economy, accounted for 52.09 percent of its GDP in H1. The economy of the developed province grew 7.7 percent in this period. Dream Town in Hangzhou, the provincial capital of Zhejiang, attracted 680 Internet-based startup programs, 6,400 talented people and more than 80 financial institutions within about one year. In H1, more than 150,000 new companies were established in Zhejiang, a jump of 35.7 percent year on year. Internet-based management tools have been widely used in product design, transformation of workshops and robotics, said Chen Ailian, chairman of Wanfeng Auto Holding Group in Zhejiang, a leading aluminum wheel manufacturer. Official data showed China’s fixed-asset investment grew 9 percent in the first half of 2016, down from 9.6 percent in the first five months and 10.7 percent in the first quarter. More notably, private investment increased 2.8 percent in the first half, down from 3.9 percent in the first five months and 5.7 percent in the first quarter. Private investment growth varied a lot from province to province in H1. In Shandong province, private investment grew 2.4 percent to reach nearly 1.7 trillion yuan in the first half. This is lower than the nation’s 2.8 percent. “Private investment in Shandong focuses on traditional manufacturing industries. But given the big environment of cutting excessive capacities, private investment has been affected a lot,” said Liu Bing, head of Shandong Macro-economy Research Institute. The base figure of private investment in Shandong has been very high and continued rapid growth will be more and more difficult, said Liu. In contrast, private investment grew 19.6 percent in the southern province of Guangdong in H1, the country’s manufacturing hub. Early restructuring moves have brought new energy to Guangdong’s economy and its manufacturing sector is still in good shape, as reflected by strong private investment, said Wang Yiyang, researcher with the Guangdong provincial government development and research center. China is aiming for 6.5 percent to 7 percent growth in 2016. But it also has to cut overcapacity and ensure job creation, and navigate the weak global economic environment. A number of provinces such as Sichuan and Hebei have struggled to reduce excessive capacity in iron, steel, cement and glass in 2016.